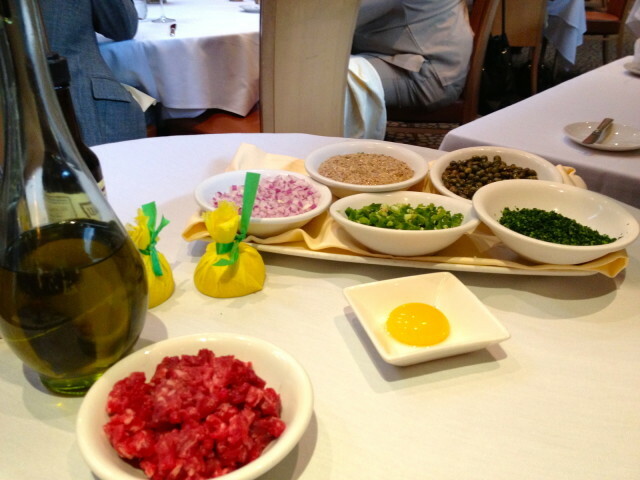 While researching this month's review of Tony's, I ordered steak tartare for lunch one day. It was great to see a complicated dish like this prepared at tableside. With two forks in a wooden bowl, the captain of waiters mashed the ingredients including onions, parsely, capers, and optional minced jalapeño (yes, please) into the hand-chopped filet mignon moistened with lemon juice. He asked me if I wanted the raw egg yolk mixed into the beef or served on top--I went with the topping. The stunning tartare was shaped like a raw hamburger patty, with the yolk balanced precariously on the mound of raw meat. It was served on a big white plate with a salad. I spread some on Tony’s house-made butter crackers and some on the crusty sourdough from the bottomless bread basket on our table. 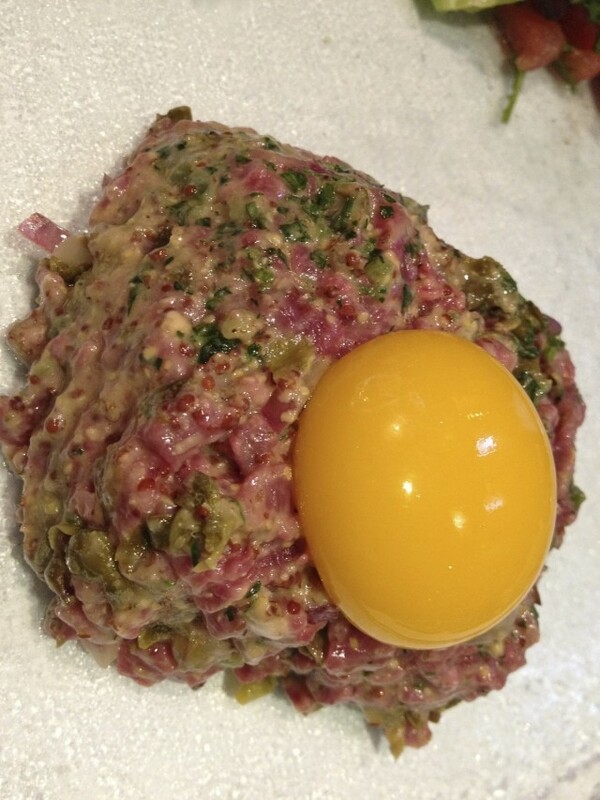 Myths that attribute the invention of steak tartare to Asian horsemen have been discredited. In the early 20th century, the dish was known in France as steak à l'Americaine. One variation called "à la tartare" was served with tartar sauce." The "Americaine" name didn't make much sense in the U.S., and so the tartare variation became the preferred name of the dish on this side of the Atlantic. It seems that tartar sauce was actually invented in France as a condiment for the raw beef dish. How exactly it became associated with fish, and when it was first employed on a catfish poor boy, remains a mystery. But I have never seen steak tartare served with tartar sauce.